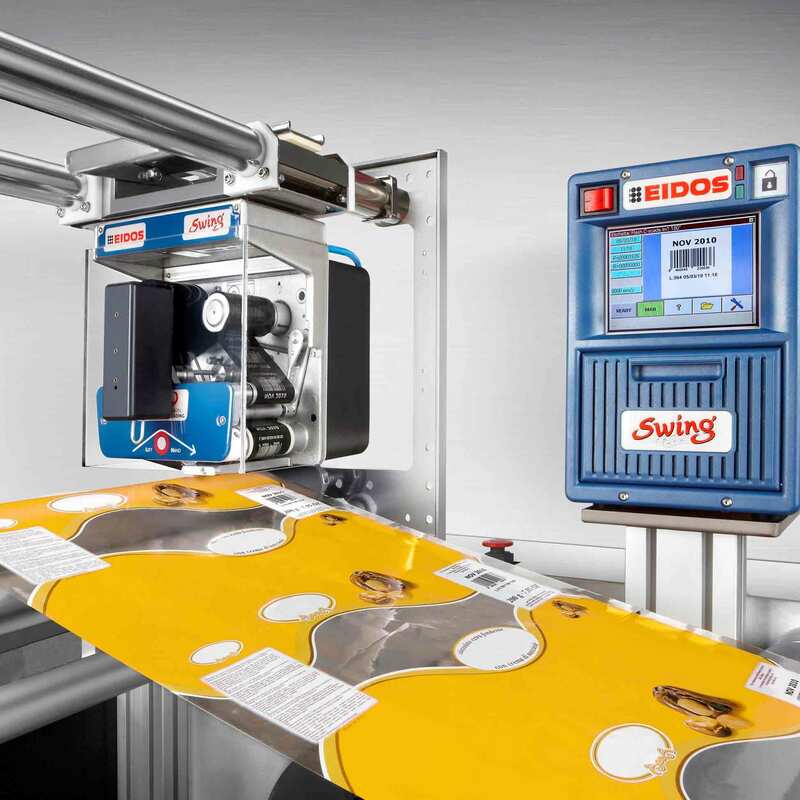 The SWING is an electronic thermal transfer printer able to print directly and automatically on the plastic or paper film used on packaging machines orindividual packs. It is used to encode with text, barcodes and logos that can be easily changed, the various production lots with extreme flexibility and high print quality and speed. The printing is made directly on the production line, enabling the product to be personalised as it is packaged, thus avoiding having to keep a large stock of pre-printed rolls. For “intermittent” type packaging machines: SWING 2.ie, SWING 4.ie, SWING 4.ieL . For “continuous” type packaging machines: SWING 1ce, 2ce, 4cl, 5cl . For “multi-tracks” type packaging machines: SWING serie X, SWING T2. For printing on blood bags, card boards, cards, tags, blisters, bags, identifying arm bands, flexible sleeves, glossy leather: SWING 2.i.SP. off line mode: Without any direct Connection to a PC. Labels and Text can load from the internal Memory from the Printer or an USB-Key over the Touch Screen Display. High Print Spedd up to 1.000mm/sec. (SWING 2ce). High Print Rate: up to 350 Beschriftungen/min. (SWING 2ce). Automatic revision of print dates (Date, time) without reducing the print rate. Barcode: EAN 8/13/128, UPC, 2/5 Interleaved, Code39, Code128, ITF-14, Paraf, HIBC43, Datamatrix and PDF417, QR-Code, etc. Import from Logos in .BMP-Format. Text Rotation: 90°, 180° and 270°. Frontal USB-HOST port, protected by flap, for inserting USB Memory Stick. RS232 connector, 9-pin, baud rate up to 115200 baud. Can be connected to LAN or WLAN via “USB-Ethernet” or “USB-Wireless” standard 802.11g connector. Converters and network devices are available as optional accessories. Refer to the accessory price list for details. SYNC-24: 4 In- and Outputs, 24V.